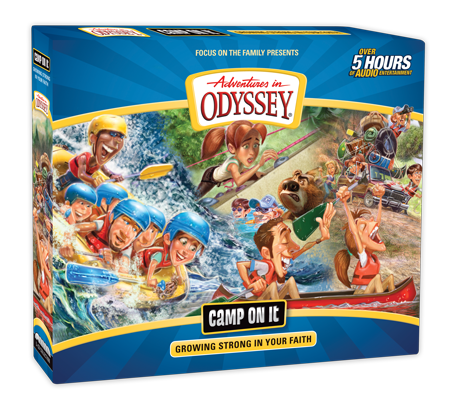 Get ready to camp on two new great Adventures in Odyssey releases available this year! There’s always something exciting to expect from the world’s #1 audio drama. Invest in this spectacular super-sized set of beautifully produced Odyssey episodes and you’ll never have another boring carpool drive again! Immerse yourself in imagination-stretching, faith-building fun with Connie, Eugene, and the whole gang at Whit’s End. Featuring all your favorite characters from past and present, this biggest-ever treasury includes 75 specially chosen programs on 25 CDs. Approx. 30 hours total. Before we even knew we were ready for it, the Odyssey team has surprised us with the biggest collection in Odyssey history in 2019. Fans old and new will find this to be a great resource for entertainment and the Adventures in Odyssey emphasizes (and often re-emphasizes) Christian values to grow by. Also be sure to listen for the special bonus features sprinkled throughout the collection! 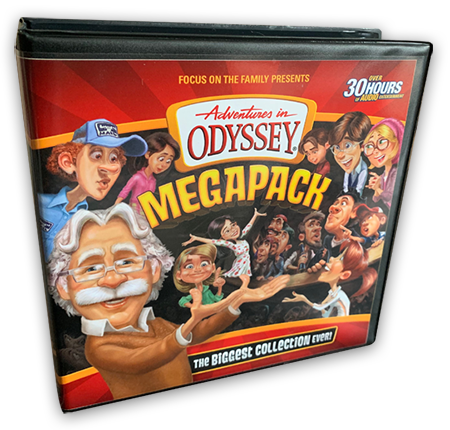 Learn more about the Adventures in Odyssey Megapack, see a list of 75 episodes included, and order exclusively through CBD. Available on CD only at this time. Join your favorite Odyssey characters on a special journey of imagination, excitement, and discovery in Camp On It. Be inspired by 14 faith-building Adventures in Odyssey audio dramas, and explore 14 days of devotions to help you embark on a lifelong journey with Jesus and live out your faith in practical ways. Approximately 5 hours; recommended for ages 8 to 12 years. Looking for an Adventures in Odyssey collection that can be used as a great companion for Christian growth? This collection includes a special 36-page devotional booklet to complement each episode included in the package. Contains one devotional per episode, along with discussion questions. This album is a perfect resource for kids and families. Learn more about Camp on It, see a list of 14 included episodes, and pre-order your copy (available to AIO Club members March 25; CD and download available May 2019).